Welcome to "Let's Make a VN," the panel where the plot's made up, and the quality doesn't matter. Here you'll find a collection of VNs made in under an hour by a team of hard-working (???) con-goers. 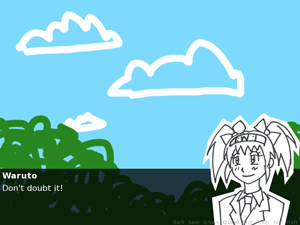 Wanna make a visual novel with us too? Let your local convention know you'd like to see us there (our contact info is here), and we could be working on a project together soon! If you're looking for visual novels that took longer than an hour to make, check out our full list of VNs! 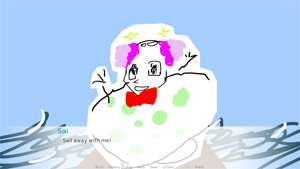 Sai the giant strawberry needs money to take up boating. 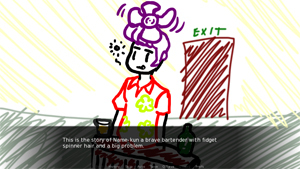 Name-kun is a bartender who wants to change the world. But how??? Voiced. 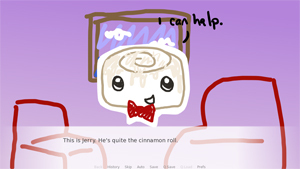 Jerry is a pirate therapist. He helps others, but who will help him? 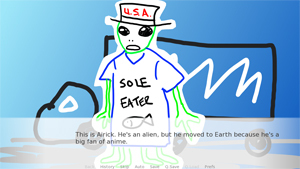 Airick the trucker has a new car, but Magical Girl Stilly wants to steal it from him. Original soundtrack. 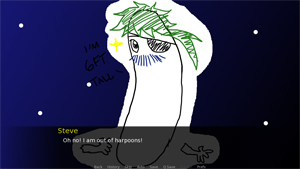 Steve the pickle is a Space Fisher in search of a white whale. Or a job. Either is fine. Voiced. 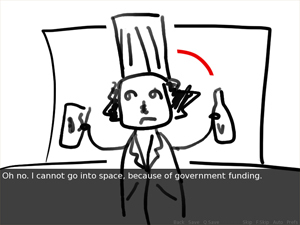 Airy dreams of being an astronaut, but government funding has been cut! What will Airy do now? Voiced. Waruto is running for President Ninja. Will she get the job? Voiced.